As an invention, the hollow-core slab is of mature age, but there are still many improvements that can be made to maximize production quality and efficiency, Finland’s Elematic Oyj contends. Whether it is an old prestressed line or a new plant, the process can be improved by removing production-related bottlenecks, while material consumption can be cut down with advanced software and automation. FloorMES E9 is a hands-on tool for supervising and planning precast floor production. The automated system enhances the efficiency of hollow-core slab production significantly as it optimizes and balances the production plan and schedules. In addition, the system monitors the work process and compares it to the original plan. 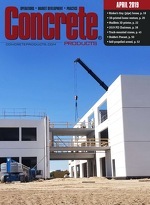 The use of concrete and design of concrete structures are long established, and the same regularities apply to both cast-in-place and precast construction. Little by little, the technology behind admixtures has become more complex and the benefits of manufacturing precast construction elements in plants have become bigger. Batching is easy to carry out correctly in supervised plant conditions. However, it is still possible to reduce the quantity of cement when it is certain that the compaction of the concrete is even and thorough. This is possible with automation. The biggest effect on compaction efficiency in hollow-core slab production is formed by the structure of the extruder and compaction mechanism. “Often, concrete casting is a bottleneck for the efficiency of precast production, especially hollow-core slabs. With the aid of advanced extruder technology, it is possible to increase both the efficiency and quality of the production. When automation is utilized in compaction, even structures with very closely inserted strands can be cast in such a smooth manner that concrete placement becomes all around even,” says Elematic Product Director, Floor Technologies Jani Eilola. Bundle lifting clamps for hollow-core slabs represent a very low cost compared to how much they increase the overall efficiency of the process. Based on extensive, personal observation of manufacturing methods around the world, he finds that a country’s construction culture affects how and what kind of hollow-core slabs are manufactured. If architectural individuality is emphasized, it is not easy to reach big production runs. Operating in this kind of business environment accentuates the implementation of individual solutions in an efficient way. “Another thing that leads away from mass production is the large quantity of issues related to building services engineering. When there are a lot of openings and different shapes, there are a lot of varying details, which become easier to implement efficiently [when] automation and digitalization are utilized,” Eilola explains. The Internet of Things is starting to be an established fact in precast concrete element production. Adoption has required that designers and manufacturers of precast element production lines realize how to apply this new technology. “A definite advantage of the Internet of Things in precast element production is its capability to streamline the production process. Thanks to continuous data collection, it is possible to plan a production process, which reserves a suitable amount of time for each work stage,” Eilola affirms. An equally big advantage in automation and digitalization is that they optimize the use of raw materials. In any case, according to Eilola, the most essential factor is the compaction technology of the extruder, starting from the geometry of the screw and the specified compaction movements. “It is all about a smoother overall work process in the plant and that the material loss can be reduced even further with numerous small individual improvements,” notes Eilola. In addition, the length of the production line has an effect on the material loss. The longer the production line, the smaller is the loss that cannot be eliminated fully from the line ends even with automation. When establishing a new hollow-core slab plant, the sales volume is first evaluated. The plant will be sized in such a manner that the utilization rate is relatively high with the volume in question. It is up to the customer to choose how much room is reserved for expansion. The most essential factor in optimizing hollow core planks’ raw materials is extruder compaction, starting from screw geometry and compaction movements. If an old production line has machines still fit for use, there is no reason to replace them with new ones in every case for the sake of efficiency, he adds, citing prospects for process improvements. A preventive policy should first be taken towards the servicing of the machines; secondly, concrete mixing can be improved with small investments. Increasing the efficiency of internal logistics is also profitable. The layout of the production area can be inspected critically: Is everything placed optimally or could something be reorganized?